Video Poker is a crossover game bridging the gap between slot games and traditional table-based poker games. Unlike traditional, spinning reel slot games, there is a degree of experience and strategy that can be applied to video poker. All the hot video poker variants can be found at all the top casinos including Club USA Casino, Planet 7 Casino, AmEx Casino, GoWild Casino, SuperSlotsCasino.com, Crazy Cherry Casino, Riverbelle Casino, Online Vegas flash casino and Silver Dollar Casino, among many others. Choose your favorite, the game play is the same at all. There is no bluffing or raising in video poker. The player makes his or her bet prior to the initial deal. 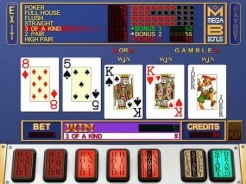 As with slot games, video poker games generally allow the player to set the coin value, most often between 10¢ and $10. The virtual cards are then dealt and the player determines what cards he or she wishes to hold. Most often, hands the best hand that is acceptable to the specific game will automatically hold. For example, if the player is playing “Jacks or Better”, and the hand dealt includes a pair of Queens, the game will automatically hold them. If the hand dealt includes a pair of queens and three Jacks, the game will automatically hold the full house. If, however, there is no minimum hand dealt, then the player must determine if he or she wishes to hold any of the cards. Once the cards to be held are selected, the player hits the deal button a second time. The held cards stay in the player’s hand, and other cards are replaced. After the second deal, the game automatically determines if there is a winning hand and makes any payout that is appropriate. Payouts can vary from one coin all the way up to 10,000 coins in some games. Do not throw away a basic hand in favor of a stellar hand. For example, if you have a Jack, Queen, King and Ace of hearts and a Jack of spades in your hand, hold onto the pair of Jacks. Do not toss the Jack of spades in the hope of getting a royal flush – the odds are 47 to 1 against, and while by lottery standards those are pretty good odds, by poker standards they are awful. If you have a hand that consists of three high cards and two low cards, choose a high card and hold it and let the rest go. If you hold all your high cards you are making less room in your hand for better cards. Remember, you may never actually see a royal flush. You will see plenty of flushes and a few straights, but the odds are that you will not see a royal flush until you have vested thousands of hours into the game. Go Play Some Video Poker! There are few games that are as much fun or as addictive as video poker. Pull your most comfortable chair up to your computer tonight and get ready to spend a few hours turning the cards – you are sure to be won over by this action packed game.